Water Purifier is also an important part of the home. Be it groundwater or municipal water, nothing is safe to drink. As water can be the reason for many diseases, it is really important to drink clean water for healthy living. This is the reason I always recommend to have a water purifier at home. A good water purifier can provide safety from several waterborne diseases. This is the reason, I decided to write a post on the best water purifiers in India. Before you buy one, you should know that there are basically three different types of water purifier. These are Gravity, UV and RO. The gravity water purifier is the most basic type of water purifiers and is for those who cannot invest much. UV water purifier uses UV rays for purification. The last type is RO that reduces the hardness of water and removes invisible impurities. Now, we also have purifiers that use both UV and RO process. Gravity water purifiers use fiber mesh, activated carbon filters, and some other methinks to remove chemicals and viruses from the water. Some brands also include Ultrafiltration process. You can also call these non-electric water purifiers. The con of using Gravity or non-electric water purifiers is that it does not remove dissolved chemical and heavy metal contamination. You also need to keep it clean regularly. Storage capacities is another important factor you need to consider. Depending on the members in your house, you need to consider the size of the water tank. If you have a larger family, you need to consider a water purifier with high storage. There are water purifiers offering more than 14 liters of a storage tank. It means options are available for all kinds of families. In this article, I have considered several factors and listed the best water purifiers for all budget segments. So, you can decide one depending on your budget. Here is the list of all kinds of best water purifiers for home. This list includes UV water purifier, RO water purifier and Gravity water purifier. You can choose the best one as per your need and use. 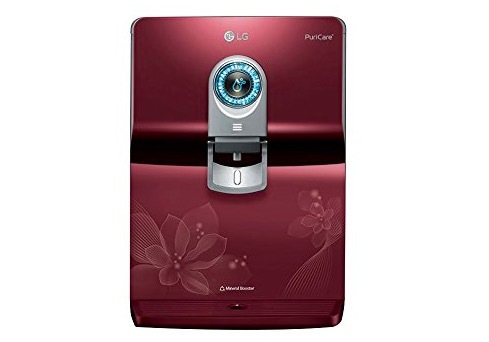 LG Puricare WW170EP costs high but offers lots of features to make it worthy of its price. It is an RO+ UV water purifier with added mineral booster option that also enhances the taste of water. 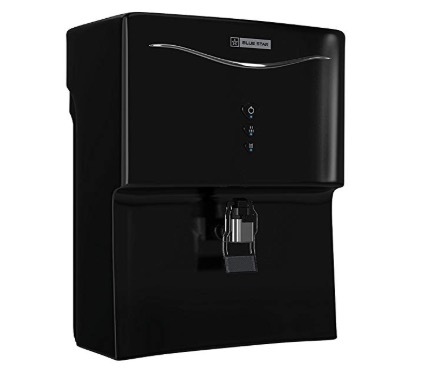 The water purifier comes with 5 stage RO filtration system that ensures safe drinking water. It doesn’t matter what kind of water source you use, it works fine. It comes with dual protection stainless steel tank that reduces the growth of bacteria and prevents the entry of dust in any way. It also has a smart display that notifies you when you need to change the filter. This display also shows the level of the storage tank. It also looks really beautiful and compliments the interior of your kitchen. Another important thing to note that LG offers free 1 years of service free of cost. The installation will also be done within 24 hours. So, you will be getting the best service experience from the company. Cheaper Alternate: There is also a cheaper model that doesn’t offer filter change notifier but offers the same 5 stage filtration from LG. That also has a stainless steel tank and the same kind of performance. You can consider that to save some extra bucks. This one is also an advanced water purifier with modern looks. It offers RO and UV purification where water first passes the RO membrane and then UV. Overall, Havells Digitouch offers 8 stage filtration before the water reaches you. It ensures you are getting pure and fresh water. It also enhances the oxygen level in purified water, adds natural minerals and also corrects the PH of purified water. You will feel the difference in the water taste. It has a smart display that keeps on telling about the water level, UV processor, cleaning processor and more. The display also has a Digital watch. It also looks really beautiful and is easy to use. The company offers free and quick installation along with excellent after sales service. 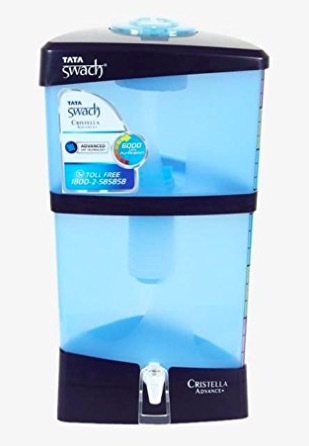 Cheaper Alternate: There is also a cheaper model that offers the same filtration but differ in design and water dispenser method. You can consider that to save some extra bucks. 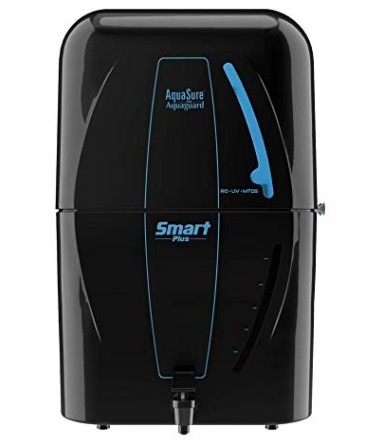 This one doesn’t look as premium as the water purifiers I listed before this one, but it offers good performance and better service option. Kent Pride Plus 11067 comes with 4 Years Free Service along with the 1-year warranty. It offers RO+UF+UV purification along with TDS Controller to ensure 100% safe and clean water. The TDS Controller retains the essential minerals to make it fit for consumption. It comes with 8 later of the water storage tank and also has a water level indicator. It has a plastic body, so you will have to make sure you are cleaning it from time to time. The water dispenser is also very ordinary tap. Even if it doesn’t look good (at least I don’t find it), there is no compromise in the performance. If you do not want to spend a lot on premium water purifiers, this one is good to go with. 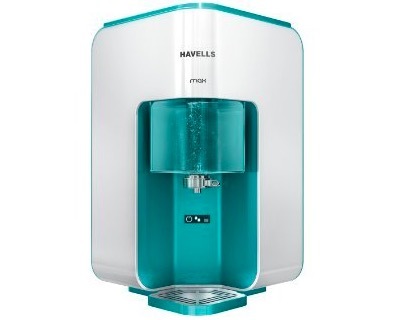 Havells Max is a cheaper model from the company for that drops a few stages of filtration. 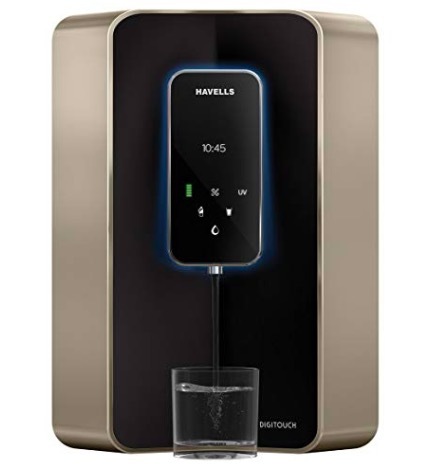 Unlike the Havells Digitouch, this one comes with 7 stage filtration processor but it has RO and UV purification to ensure safe drinking water. It also corrects the PH of purified water and adds natural minerals. So, there is no compromise in primary filtration processes. It also comes with a different design that looks really good. It has a tank full indicator and purification process indicator. It comes with 8-liters of the tank that is sufficient for most of the households. It also works with all kinds of water sources and 100% Water passes through RO. If you do not want to spend high on the Havells Digitouch, this one should be your choice from the same brand. As the name suggests, this water purifier comes with RO + UV + UF + Taste enhancer technology. It has a total of 7 stages of the purification process and its RO membrane decontaminates up to 75-80 gallons of water per day. 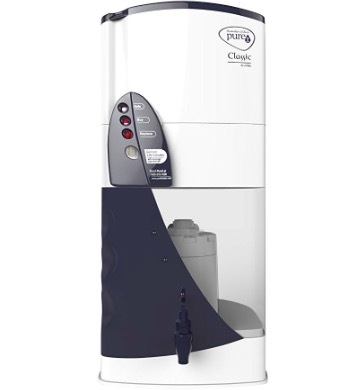 This water purifier also acts on chlorine and other dangerous organic substances. In this way, it ensures you are getting clean and safe drinking water. It doesn’t look good and feels cheap due to the plastic build. But it performs well and works on all kinds of water sources. If you do not want to spend much, you can also consider this one. 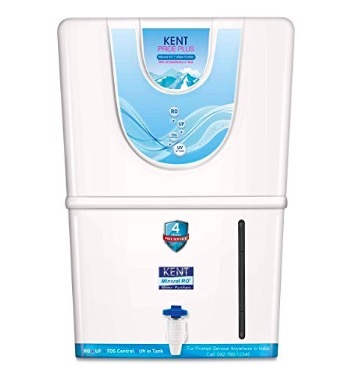 Blue Star Aristo is a good looking water purifier at a considerably cheaper price. It looks as good as LG’s Puricare range but costs lesser. Blue Star Aristo offers RO+UV filtration processor. It comes with a 6-stage Purification Process that also include aqua taste booster. The aqua taste booster uses calcite media to enhance taste and it also maintains the optimum pH level of water. It also shows alerts for purification, full tank, and low pressure. There is also a UV fail alert that provides prompt alerts in case of UV lamp failure. It comes with 7 liters of the storage tank to keep the pure water. It also has a child lock button on the tap to ensure there is no unnecessary wastage of water. The build is plastic but it looks good. It also works fine and can be recommended. This one is also a good water purifier offering Advanced RO+UV+MTDS purification. It also comes with MTDS controller that offers adjustment of taste depending upon the source of water. It has 6 liters and also includes a water level indicator. It has a smart design and LED indicators that look good. As per claims, it comes with 6000 litres cartridge life that means it can easily work over a year offering pure water to you and your family. It also has Smart plus protection to keep it safe from voltage fluctuation. It also comes with a sensor that helps saves energy by automatically powering it off when the tan is full. If you have no high budget for UR or RO water purifiers, you can try using gravity purifiers. These don’t work as good as costly water puffers, but still good to go with. This water purifier claims to remove around 1 crore virus of water. It comes with 23 liters of the tank that has 9 liters in the bottom container for purified water. This water purifier has a germ kill kit to ensure your water is safe. There is also a GKK life indicator that tells you when you need to change it. It is also a non-electric gravity water purifier that costs less than Rs. 2000 and offers good performance. The filter used in this water purifier can purify up to 6000ltr water. That turns out to be 10 paise per liter. It has 18 liters of capacity where the 9 later is reserved for purified water. It uses a gravity-driven desktop ultrafiltration process. It can work on a wide range of pH (5.5 – 9.0) and TDS (up to 1500 ppm). The water flow rate is 4 to 5literss per hour that is also good. It comes with a good plastic body that is sturdy and Scratch resistant. It also has 2-way dispenser tap. There is also a Water Level Indicator. Which water purifier brand offers the best after-sales services? There is no specific brand to answer here. It is because all brands are proactive in offering good after-sales services. It only depends on the area you are living in. Few brands have pan India reach while few have reach to a limited number of cities. LG, Havells, Kent, Pureit and many other brands are good in after-sales service. TDS controller consolers the proportion of TDS coming in the output of water purifier. It maintains the TDS in between the acceptable TDS range. What is the best TDS level for drinking water? If TDS level is below 900 mg/liter it is good for consuming. Still, you need to know how this range works. If TDS is less than 300 mg/liter, it is excellent. It is good if TDS is between 300 and 600 mg/liter and fair if it is between 600 and 900 mg/liter. Anything higher than 1200 mg/liter is unacceptable. Is low TDS water is harmful? There is no evidence of this. On submarines, people consume water with TDS levels below 3 mg/L and there have been no health problems reported by the Navy. So, it is safe to consume Low TDS water. What is RO UV UF TDS? RO is an acronym for Reverse Osmosis. It removes ions, molecules and larger particles from drinking water. UV is an acronym for Ultra Violet rays that issued to kill the microbes and germs. UF is for Ultrafiltration. TDS is the acronym for Total Dissolved Solids. 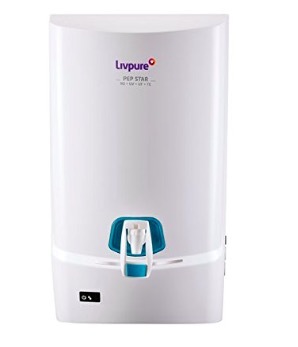 Will I get the warranty if I buy a water purifier online? Yes, all online purchases come with a proper invoice. You only need that invoice to avail the warranty. But make sure you are buying it from a trustworthy online retailer. You can also buy an extended warranty at a minimal price from those online stores. What is the maintenance cost of RO water purifier? Most of the water purifier brands offer free 1-year maintenance. Kent even goes a step ahead by offering 4 years of free maintenance. After that, you will have to buy the standard AMC packages. Generally, it costs in between Rs. 4000 to Rs. 8000 depending on water purifier brand and purifier model. I have tried to explain everything in easy to understand manner. So, I hope this guide has helped you in making an easy decision. I have included all kinds of water purifiers. So, you can buy one depending on your budget and choice. The best one is that offering RO+UV+UF+TDS Controller facilities. And I have included water purifiers offering it. You can buy any of the water purifiers added in this list. If you have anything to ask, you can leave it in the comments and I will be happy to answer it.